One of the things I’ve learned over the nearly 20 years that I’ve been in business is just how valuable the peer network is to businesses. This understanding was part of the rationale for introducing the CloudU program and in particular the LinkedIn community – it’s a chance for people to contribute in a “for the community, by the community” type way. It’s been interesting the way Xero has developed its community of interest over the past few years. they have a wide spread of stakeholders – from partners building products in the ecosystem, to account practitioners, to end users. Over the past few years there have been a number of different initiative that they’ve taken in terms of the community – UserVoice groups for development prioritization, a LinkedIn group for end users to share and discuss issues on, meetups, conferences and roadshows. 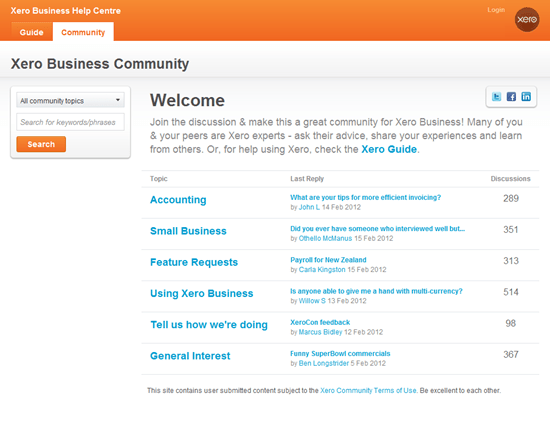 Xero Community is an extension of our popular Help Centre and complements our other social channels. It’s a place where Xero customers and partners can ask and answer questions and share knowledge. It’s a smart move, it’s a way for Xero to not only reduce their own support costs (by enabling users to help each other with problems, ideas and issues) but it’s also creating a central hub of thought leadership, similar to the Zendesk blog (disclosure, I previously contributed to this blog) that aims to be the go-to place for customer support thought leadership. Reducing support costs, building customer engagement, helping channel partners engage with their own customers and building a thought leadership position – all smart moves that should richly reward the investment in creating the community.